Economic inequality has become a major focus of debates about economic policy, both in the United States and around the world. And as a new Pew Research Center survey highlights, the gap between rich and poor is seen as a major problem among all the publics polled in 44 nations across the globe. However, we found that people in the emerging and developing world are optimistic about the financial future of their children. It’s a different story in richer nations, where most believe prospects for the next generation are grim. Here are five key takeaways from a new Pew Research report on what the world thinks about opportunity and inequality. 1 There is widespread pessimism in rich countries, with many saying that today’s young people will do worse economically than the generation that came before. 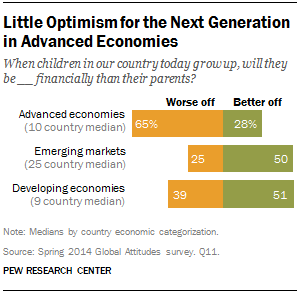 Across the 10 economically advanced nations surveyed, a median of 65% believe that when children in their country grow up, they will be financially worse off than their parents. In the U.S., 65% say American children will be worse off, while just 30% think they will do better financially than their parents. 2A major reason why emerging and developing nations are more optimistic is that their economies have performed better in recent years. 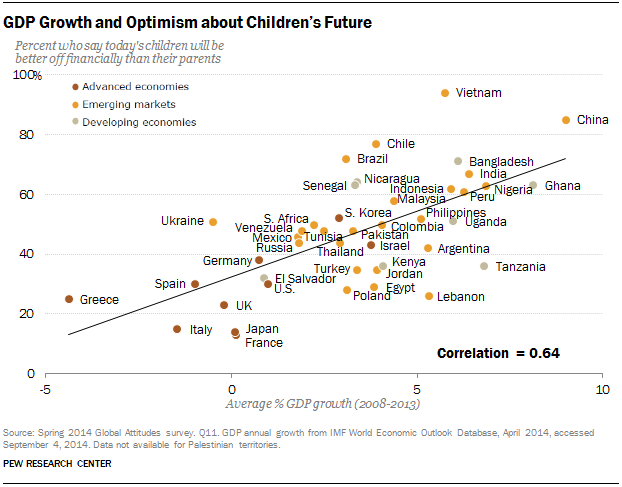 Overall, there is a strong relationship between economic growth and optimism for the next generation. People in countries that have had strong growth since 2008 – such as China, Vietnam and Ghana – are much more likely to say today’s children will be better off than their parents. In nations hit hard by the Great Recession – such as Greece, Spain and Italy – there is much less optimism. 3Across the globe, there is widespread support for free markets. Even though many people worry about the gap between rich and poor, majorities across the globe are willing to accept some inequality to have a free market system. A global median of 66% say most people are better off under capitalism, even if some people are rich and some are poor. Confidence in the free market system is especially strong in developing nations. 4Global publics agree that education is a key to success. When asked to rate, on a scale of 0-10, how important a good education is to getting ahead in life, a median of 60% across the 44 countries surveyed said “10.” None of the other factors tested – hard work, knowing the right people, luck, belonging to a wealthy family, being male or giving bribes – rated as highly. 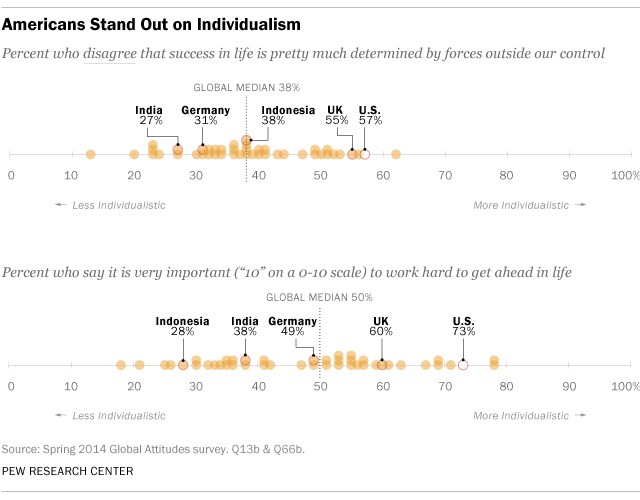 5Individualism is often considered a central feature of American identity, and the survey highlights some of the ways in which Americans are more individualistic than many others around the world. For instance, Americans are especially likely to believe that hard work is a key to success and to think that success in life is not determined by forces beyond our control.